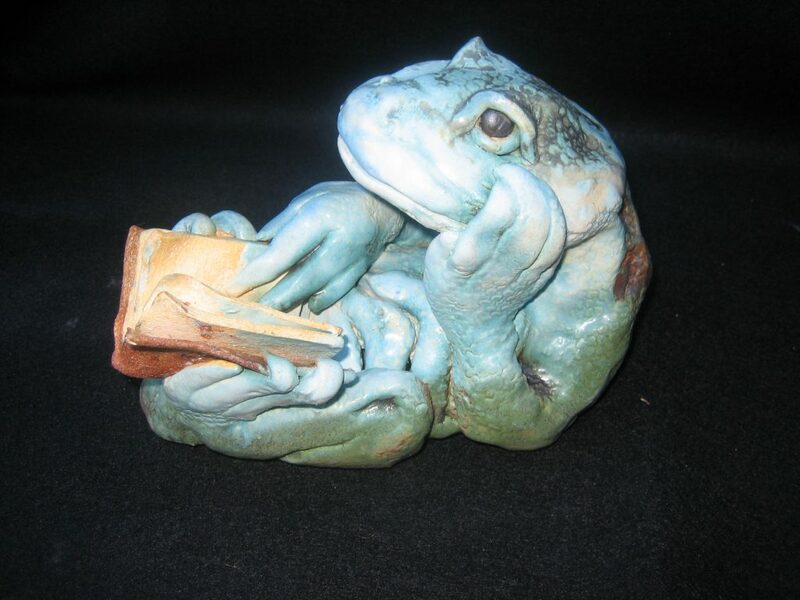 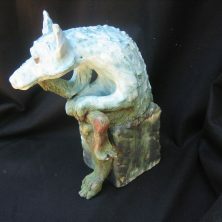 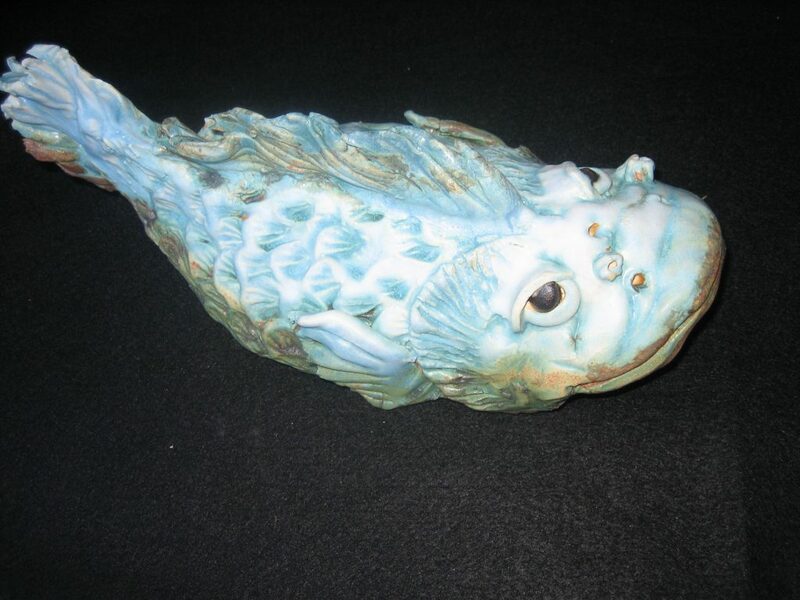 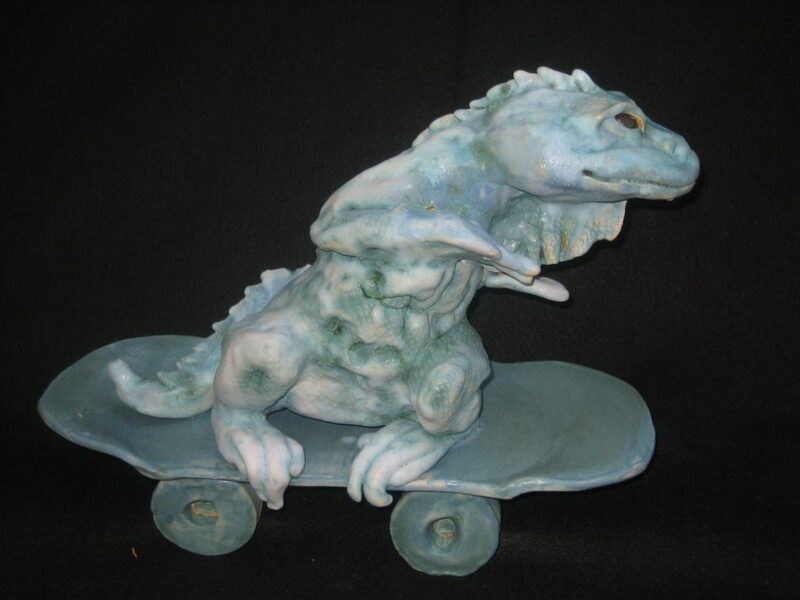 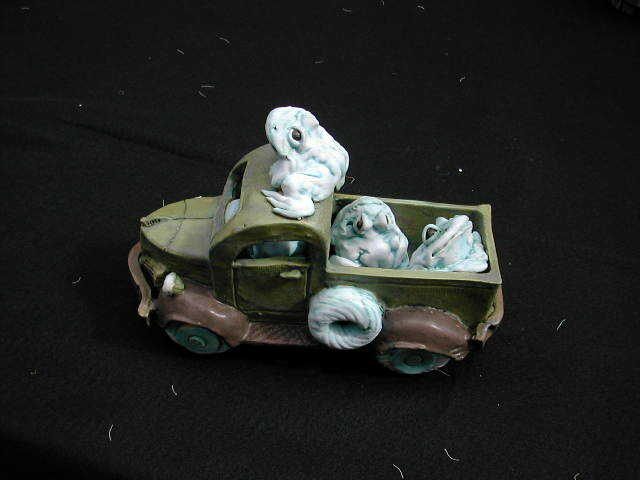 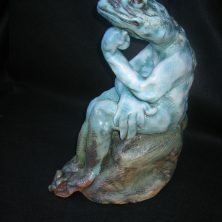 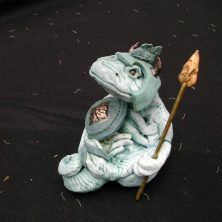 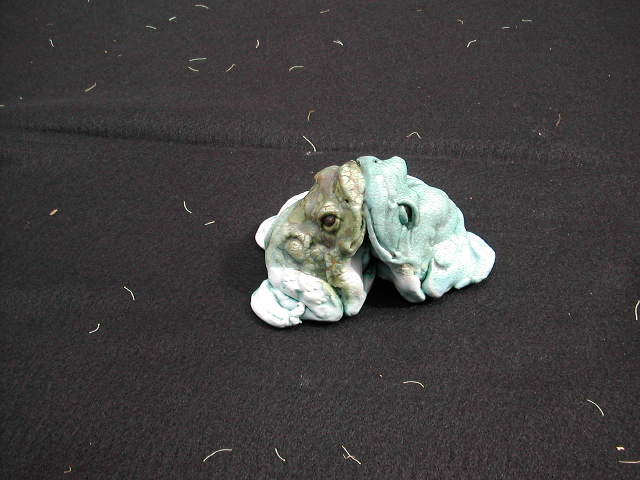 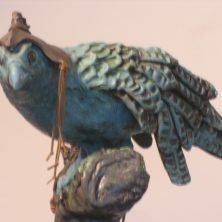 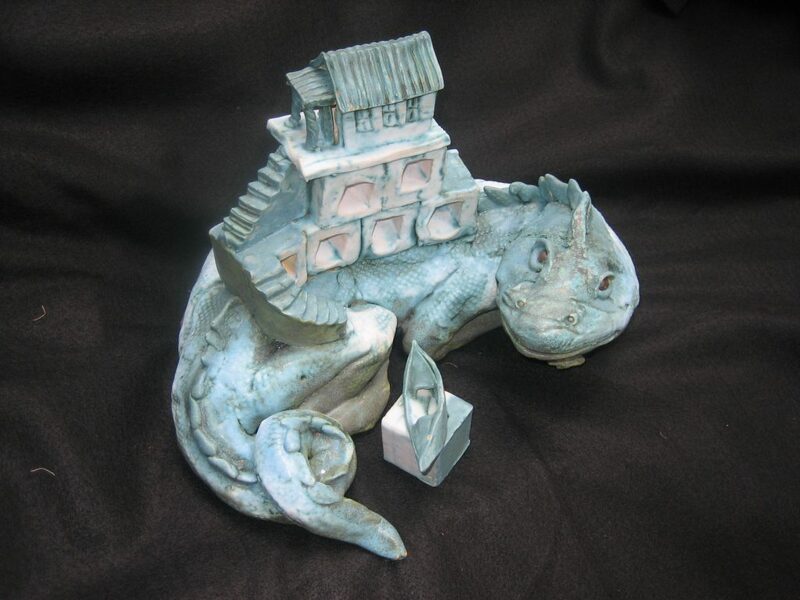 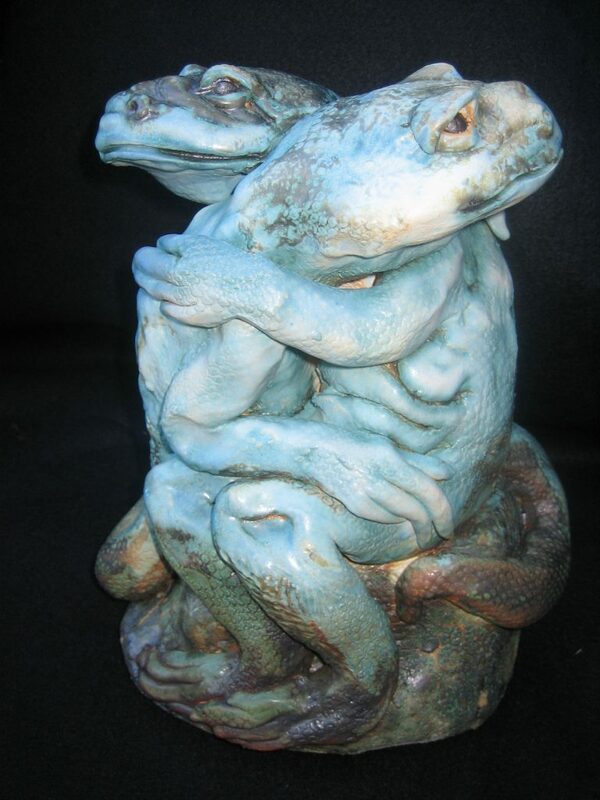 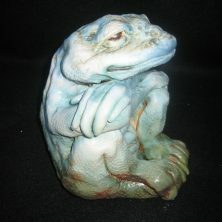 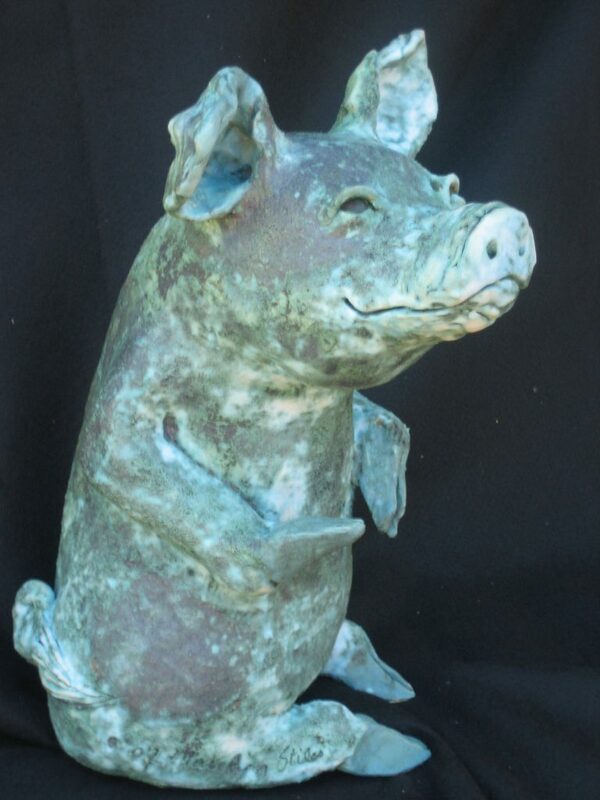 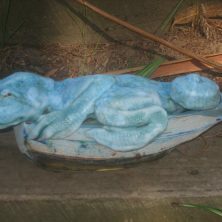 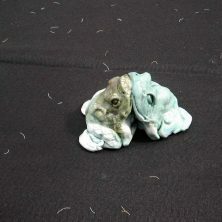 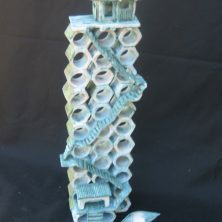 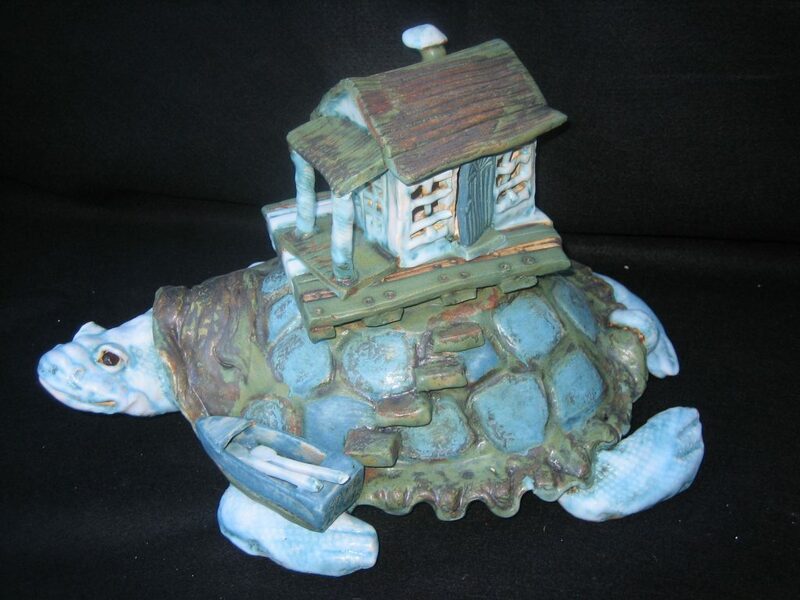 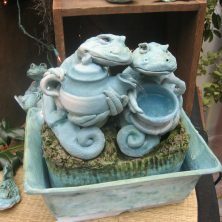 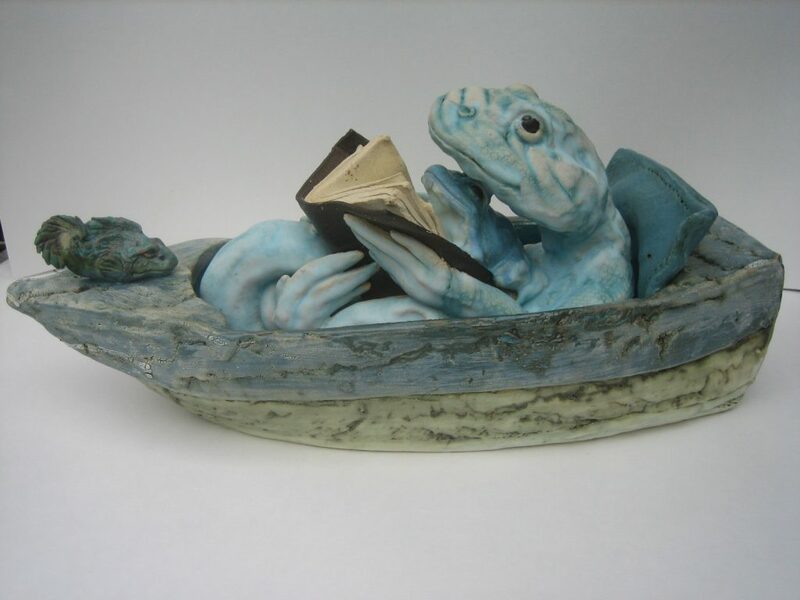 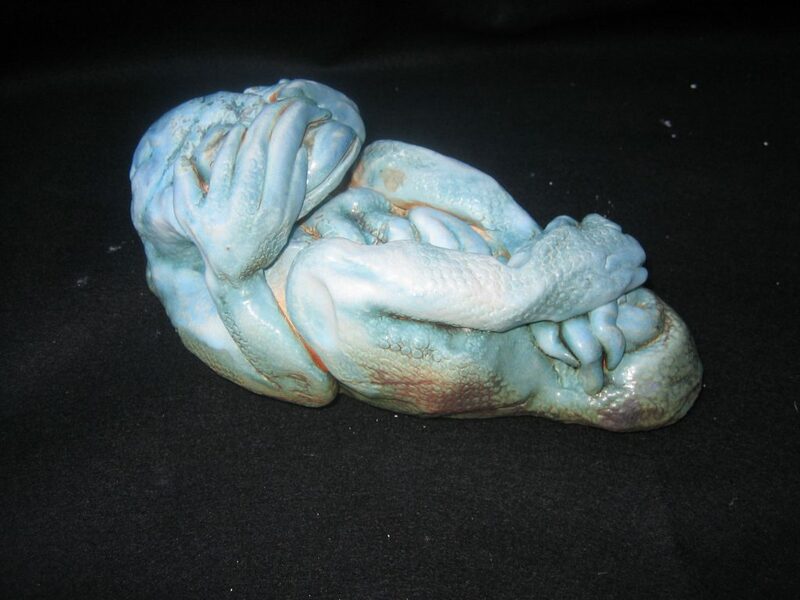 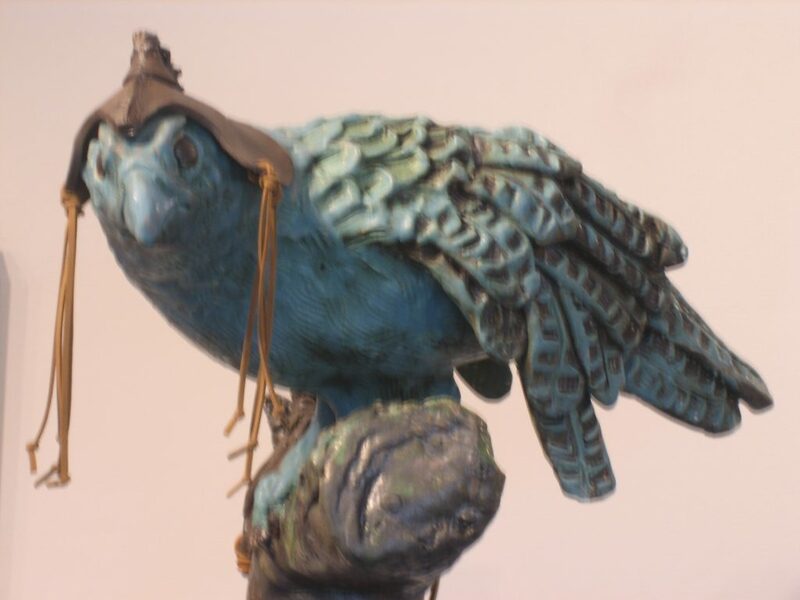 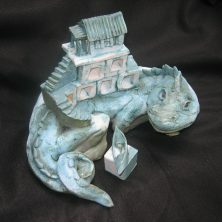 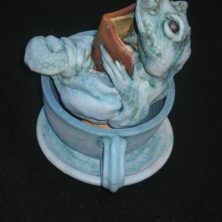 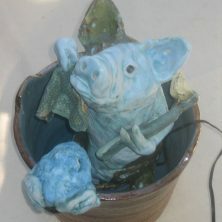 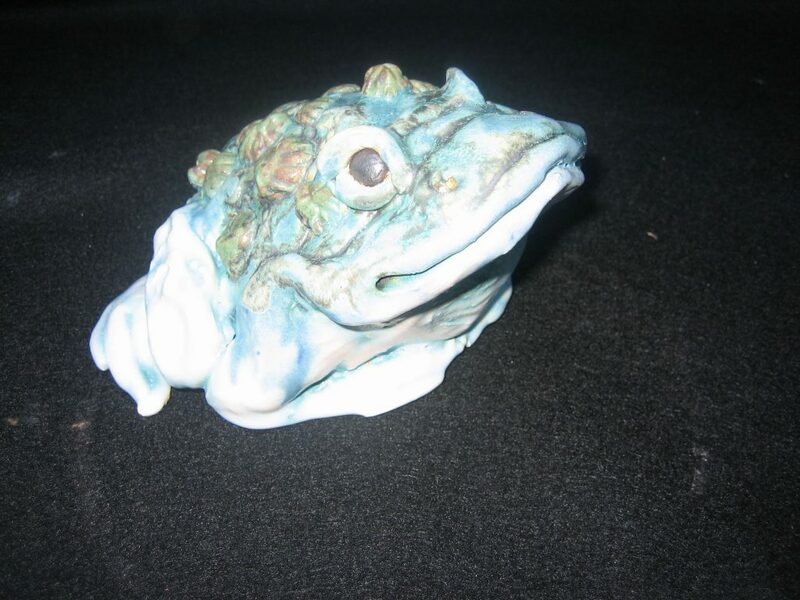 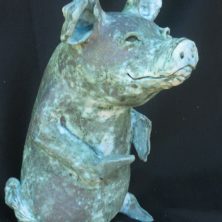 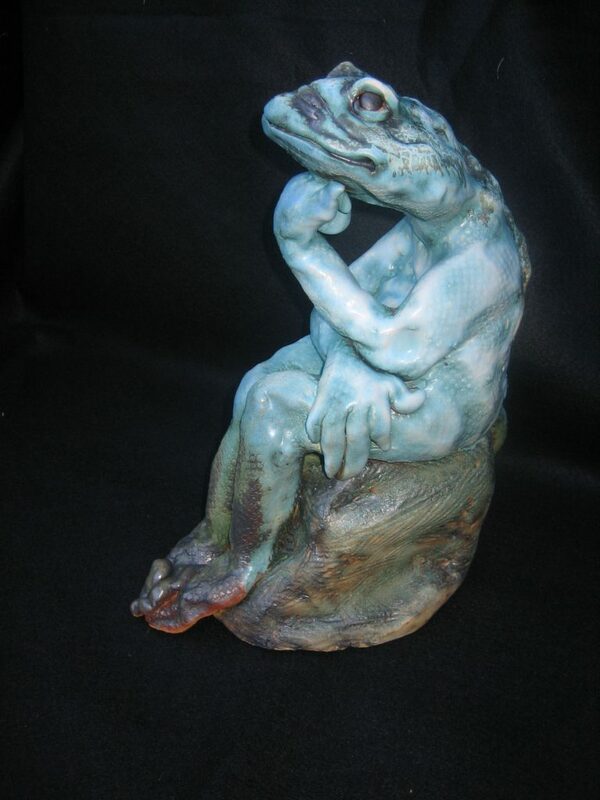 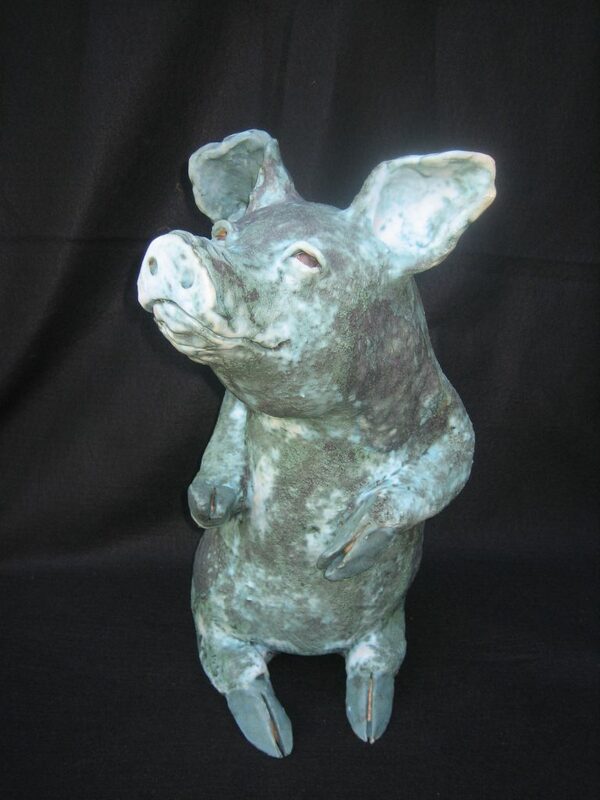 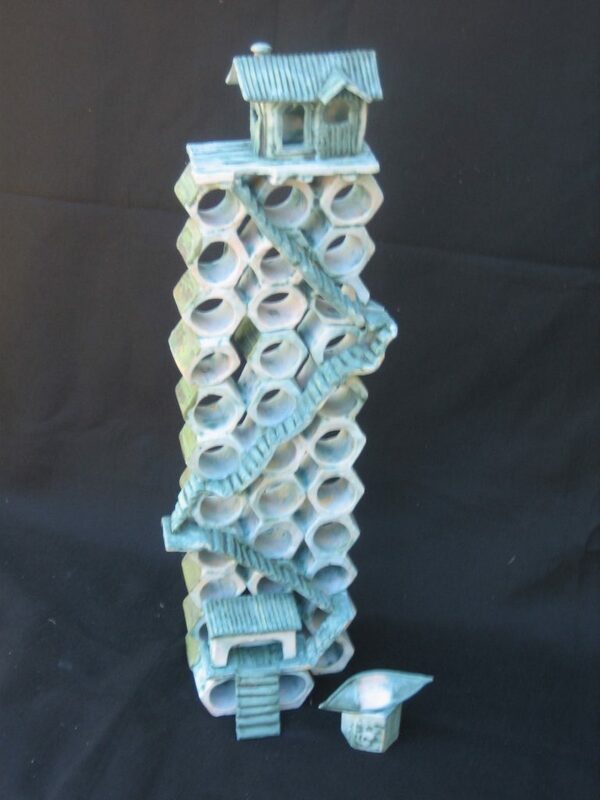 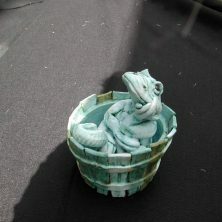 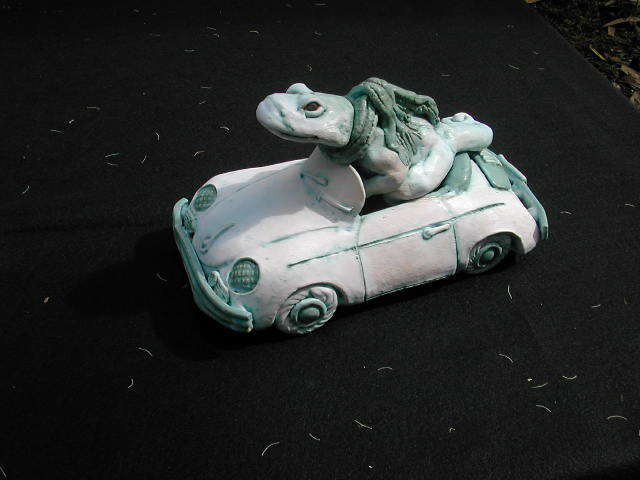 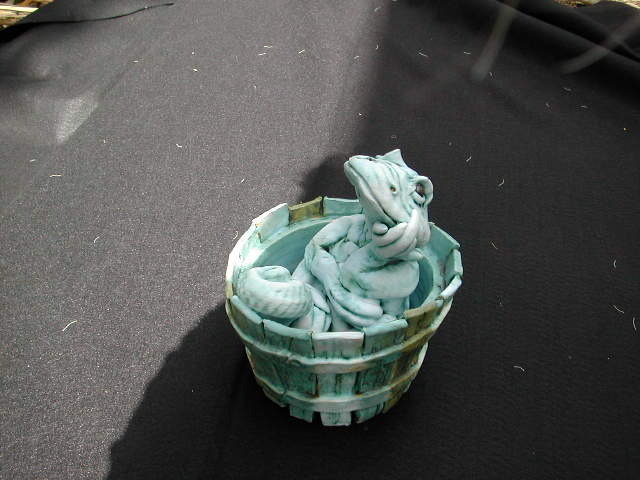 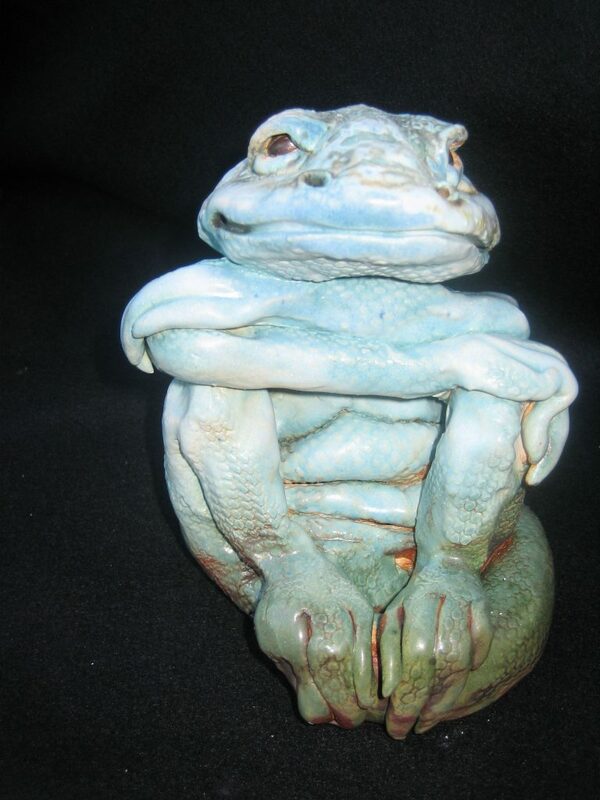 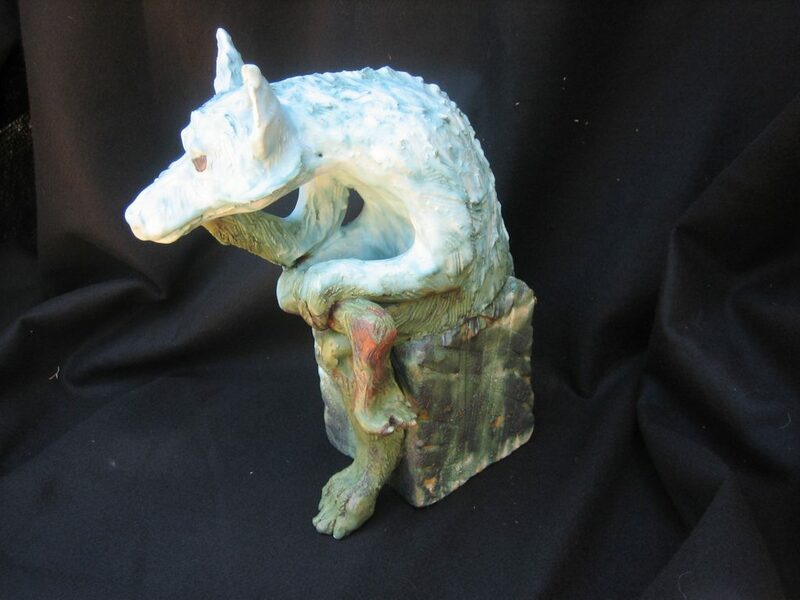 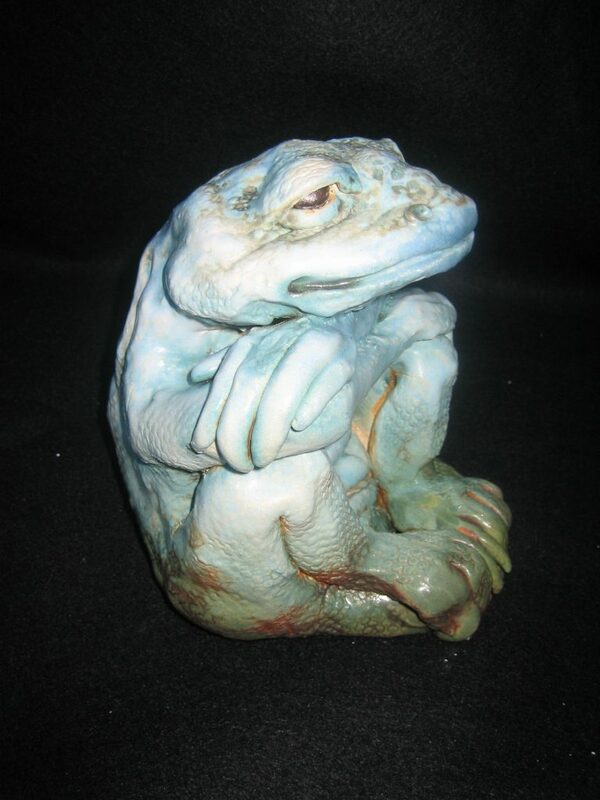 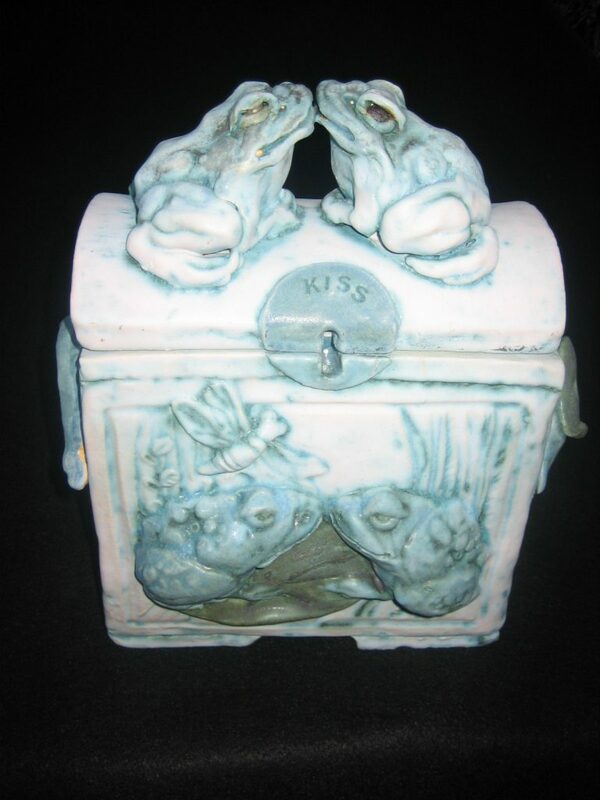 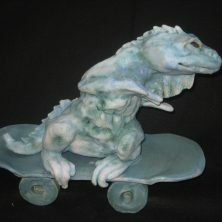 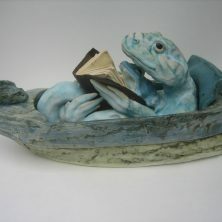 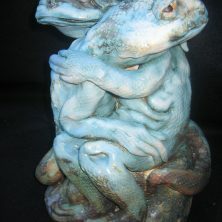 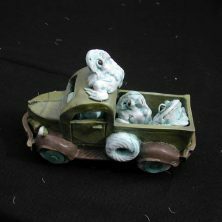 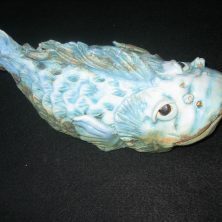 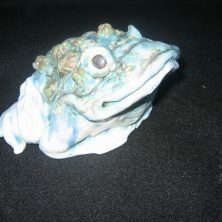 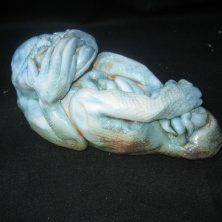 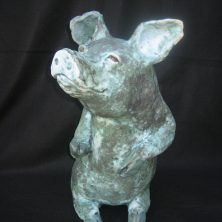 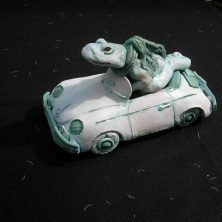 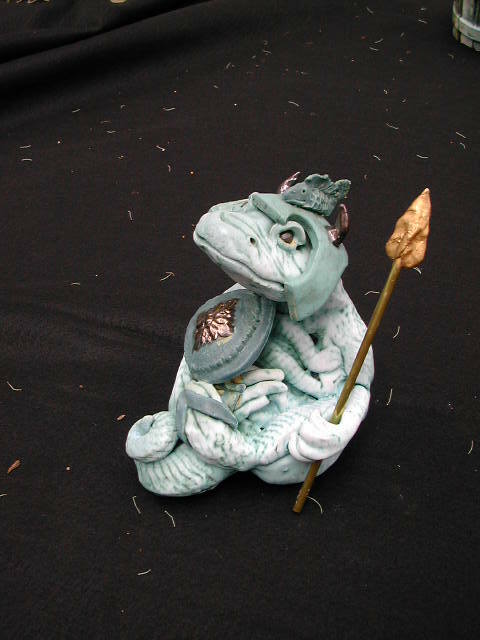 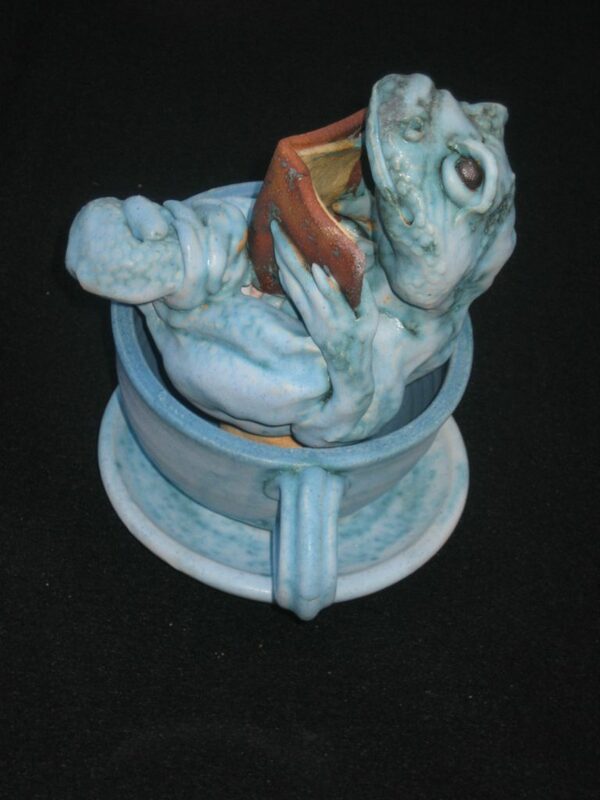 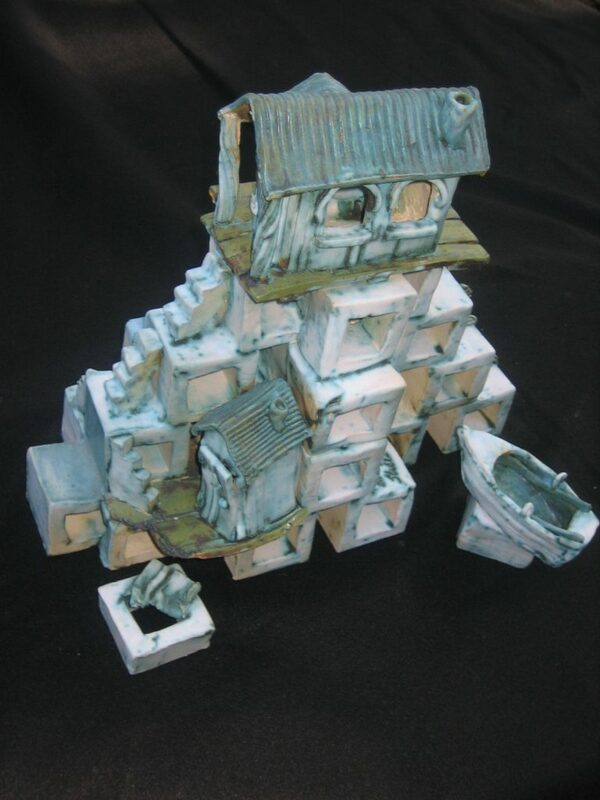 Once you have seen the magical and whimsical clay sculptures or ‘critters’ by Marilyn, you want to know the artists. 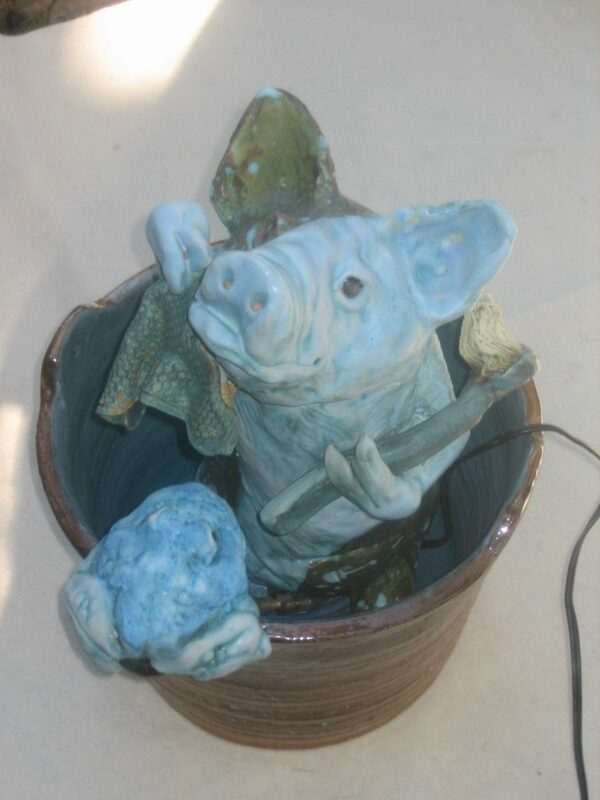 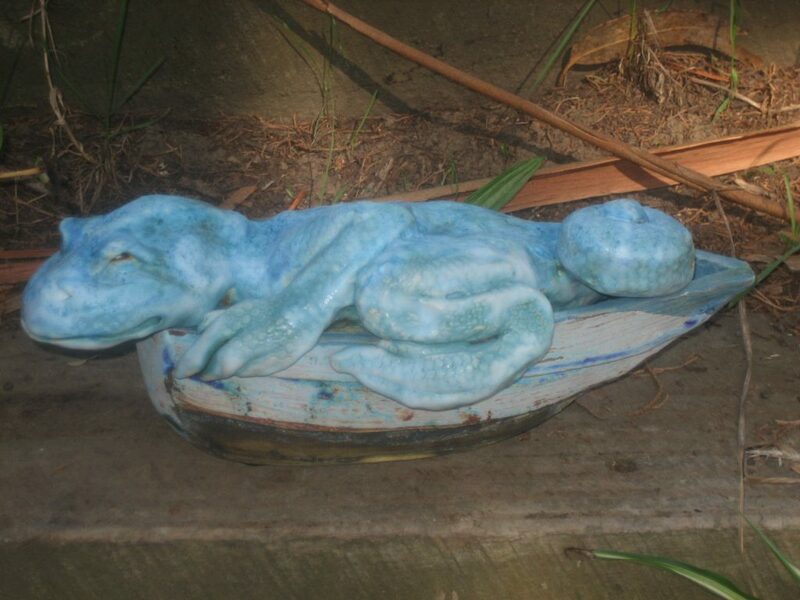 Her lizards, toads, frogs, slugs, ravens, foxes and pigs speak volumes for the sense of humor and dignity she imparts to her clay friends. 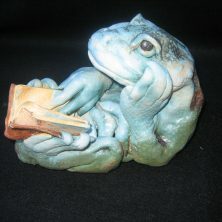 A reclining lizard reading a book on a path on a warm sunny day; a pig adorned with carpenter belt filled with tools ready for work; a pair of ravens in deep conversation on a tree limb, or a crafty fox with tilted cap who may have just raided the chicken coop, all anatomically fashioned so their true nature cannot be denied, yet so human in their pose and expression that the viewer can’t help but smile and be amused. 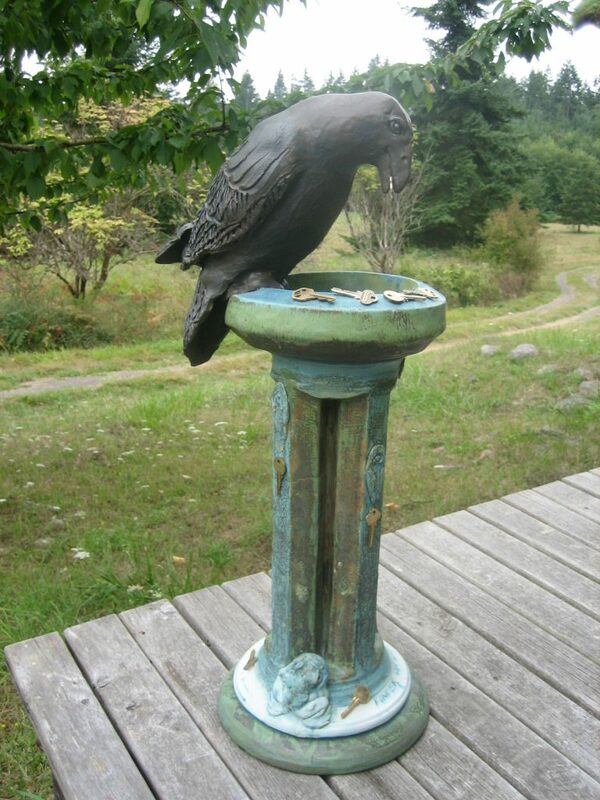 So it was with great anticipation that the Muir Beach Garden Club commissioned Marilyn to create a fountain to sit at the foot of the 3 lovely Japanese maples that we planted in the early Spring of 2008. 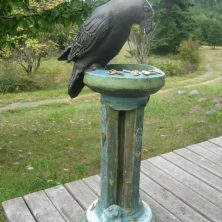 When she saw the location, she simply smiled and said, “I already have the fountain that is a perfect complement for the site.” Collaborating with Master Mason, John John Sward, who created the perfect basin and beautifully stacked, slate background for the installation, the site has become a visual and auditory focal point on the North facing side of the Community Center. 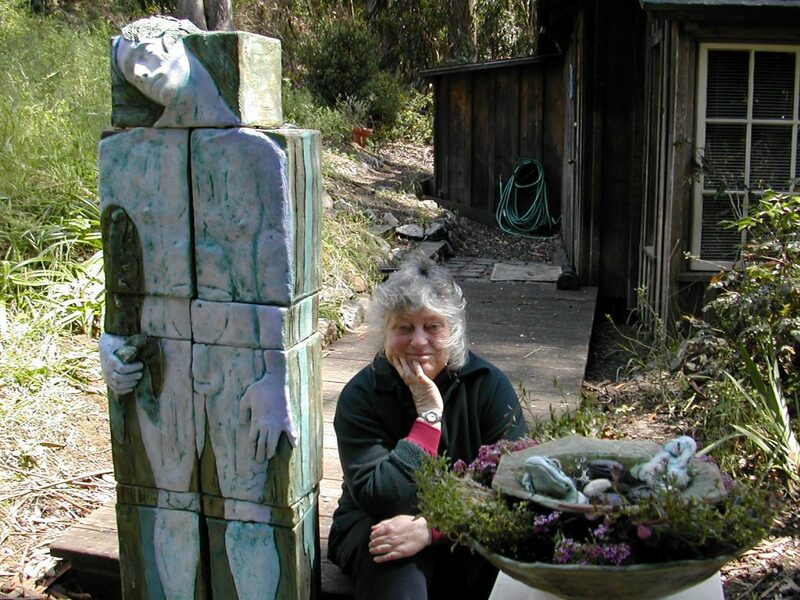 After graduating in Art Education from SUNY Buffalo in 1961, Marilyn taught elementary school art in Liverpool, New York, then spent 2 years in Peru in the Peace Corps with the purpose of developing craft cooperatives among the artisans she worked with. 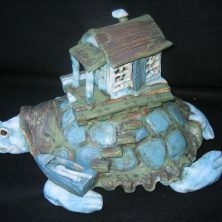 Upon her return, she married Ed Stiles, master craftsman, and they moved to Druid Heights, California . 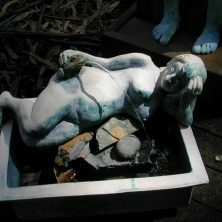 That was 46 years ago. 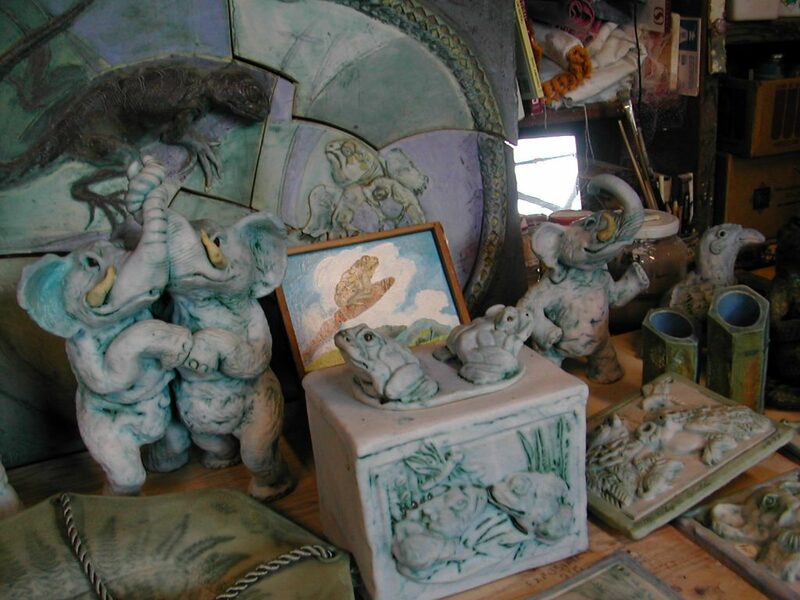 She worked for several years in the Open Studio at U.C. 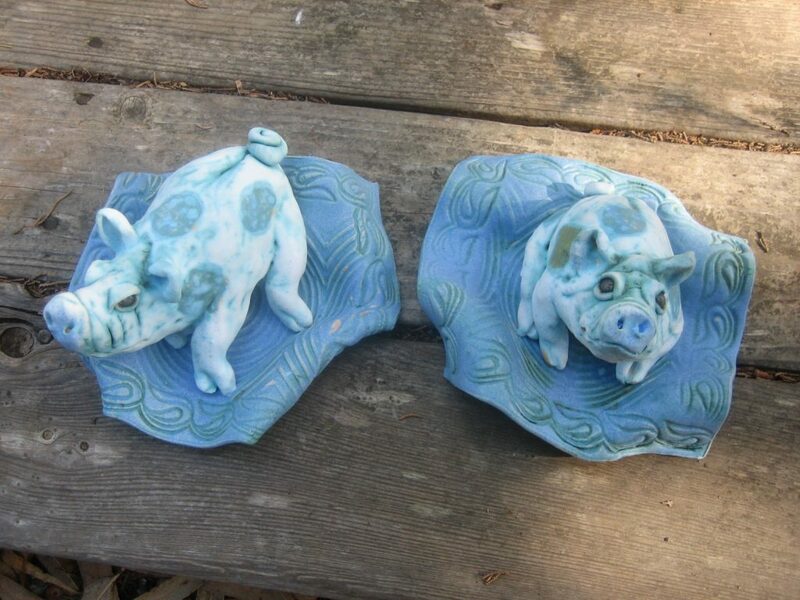 Berkeley and later taught ceramics at St. Domenico High School. 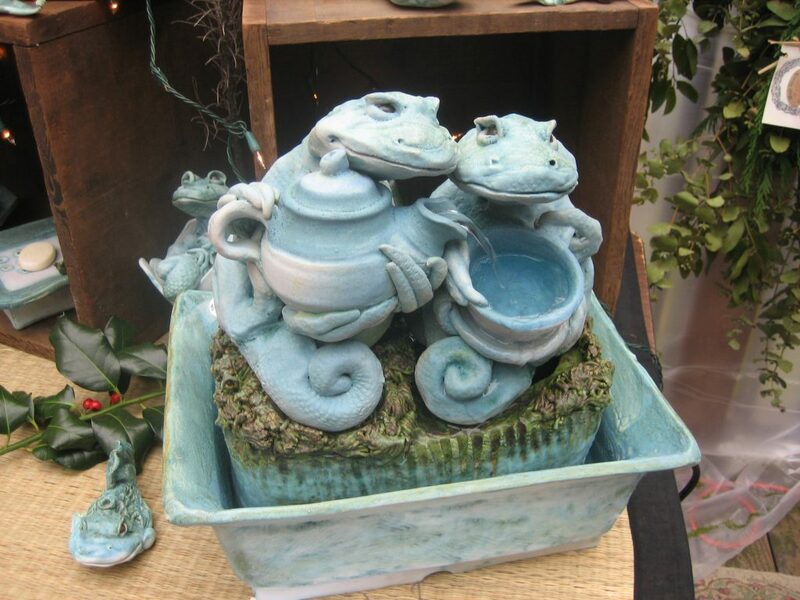 The Stiles have two sons: Seth who lives in London with his wife Cat, and Wyeth and his wife Trina, who have two beautiful girls, Siena 6 and Raya 3, currently residing in Bellingham, Washington. 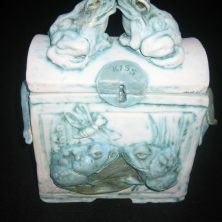 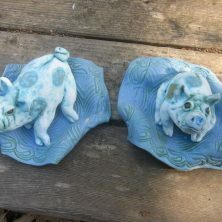 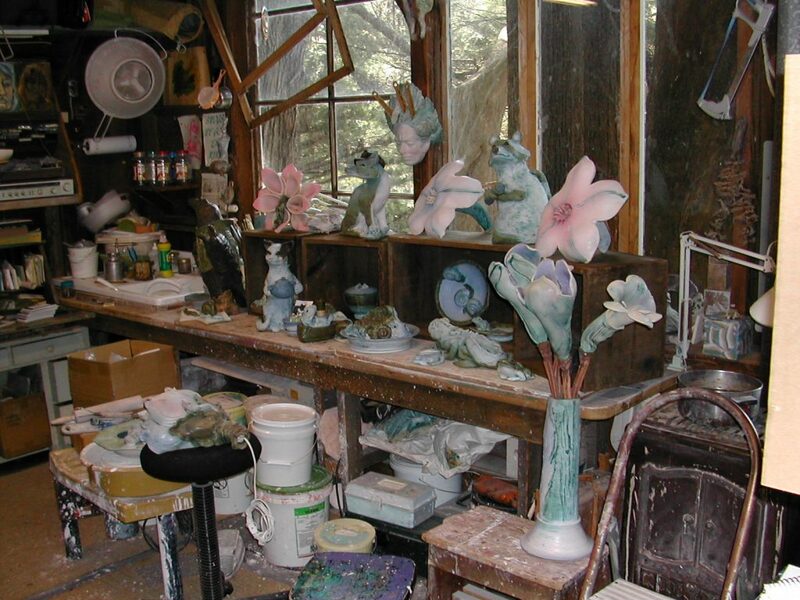 Marilyn’s signature turquoise-blue glaze is one she has used for many years. 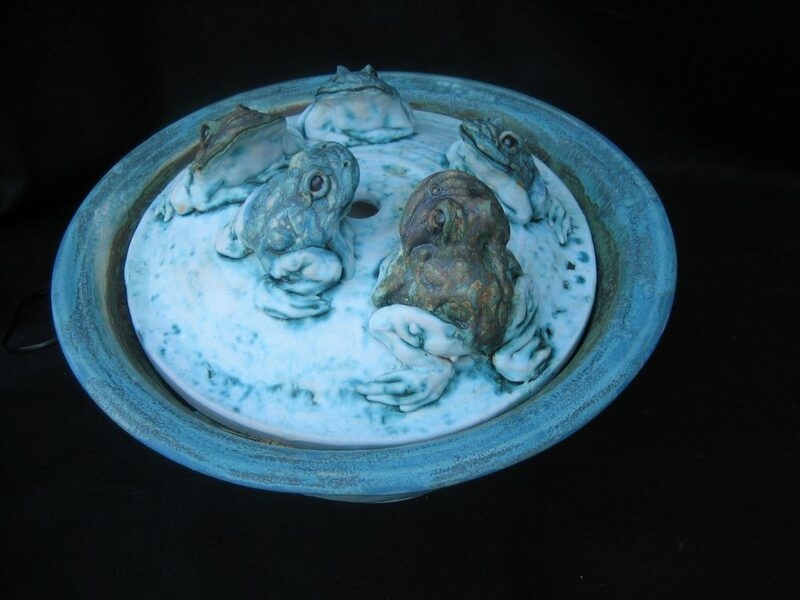 “It’s a white stoneware that I fire to cone 6, mid-range. 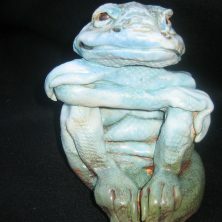 I mix the glaze then add different colorants: copper, cobalt and iron. 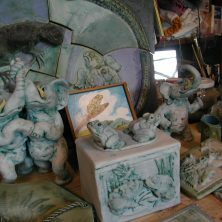 The amazing thing is that the process of creation is never boring and opening the kiln is either a surprise or a disappointment. 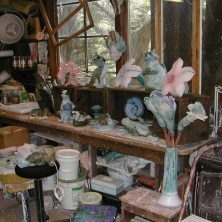 There’s always something new to learn or attempt….I consider myself to be very fortunate.” And we feel fortunate to have Marilyn as a neighbor and local artist. 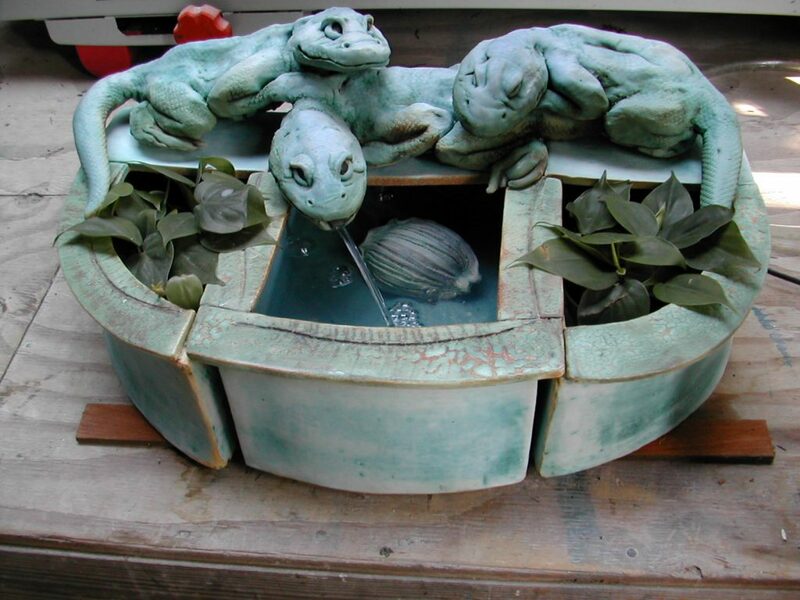 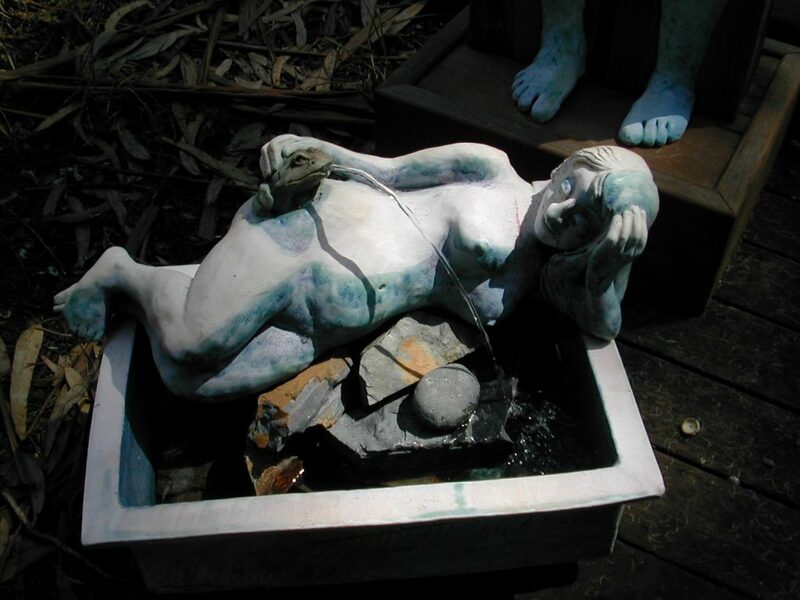 The Muir Beach Garden Club hopes that the fountain will add to the ambiance of what makes our community so special, and to thank Marilyn Stiles and John John Sward for their beautiful work. 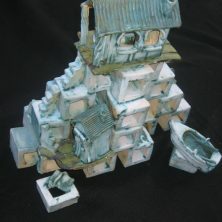 Please take some time to visit the installation and enjoy the view as you have your coffee and scone at Bistro. 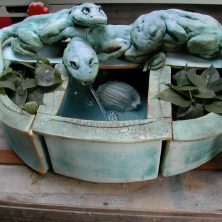 And please remind our younger residents that this is an art installation to be viewed and not a play structure or a wading pool. 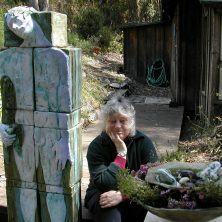 For more information on Marilyn Stiles please visit: http://marilynstiles.com/. 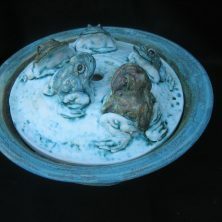 Marilyn’s work can also be seen and purchased at the annual Quiters Xmas Fair.